Simple solutions to access mobile PayPal. Accept mobile payments from PayPal® to make the sale when your audience's interest is at its peak. Mobile payments can be triggered from a 2D barcode or from a link in a mobile landing page. Both options are direct to content. Inbound / outbound tracking. Full analytics are available. 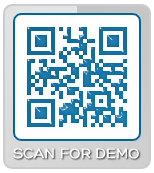 Scan the code to demo mobile PayPal® in action.